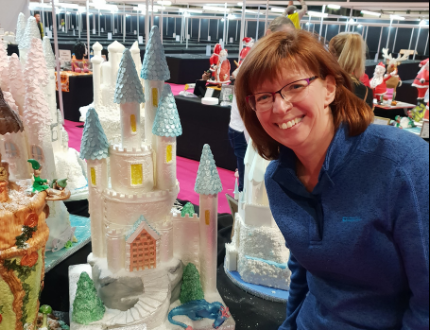 Cake International brings all of the best cake decorators, cake hobbyists and cake enthusiasts from all across the world together for a very special weekend every year. To celebrate this grand event, for the last few years, CakeFlix (and previously the Paul Bradford Sugarcraft School) have put on special display tables for our Pro members. 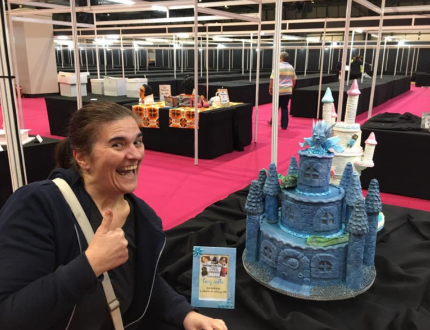 These display tables allow our members to showcase their talents, and what they've learned via our online courses, to thousands of people at the biggest cake show in the world. Each year we pick a few themes for our members to choose from, where they then create their cake around based on tutorials we have in the site. 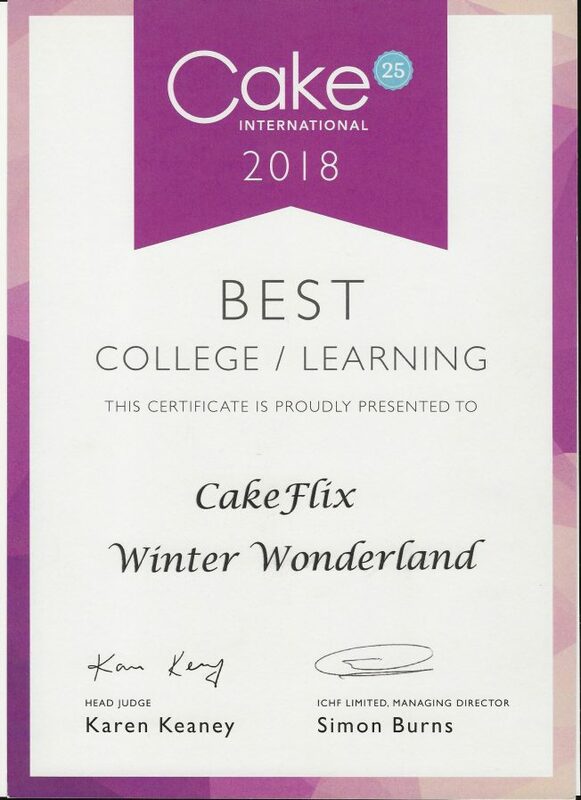 This year our themes were Rockin Rudolph', Carousel, Fairy Castle and our Cake International Gold certificate winning Winter Wonderland (based on any of our wedding cake tutorials). Incredibly, we had over 100 of our students cakes displayed at the show with members travelling from all across the world to contribute. We had hobby cake makers, newbie cake makers and professionals all showing off their work on our stands. 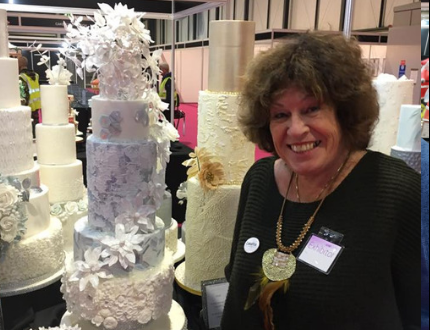 Now that the dust has settled, we thought, what better time to catch up with just a few of our contributors to find out a little more about them and their experience at Cake international. My name is Samantha Wood and I own Samdango’s Cake Shack in East Sussex. I’ve been a CakeFlix member for two years now and have been making cakes since 2011, but only started doing it professionally when I opened my business in 2017. 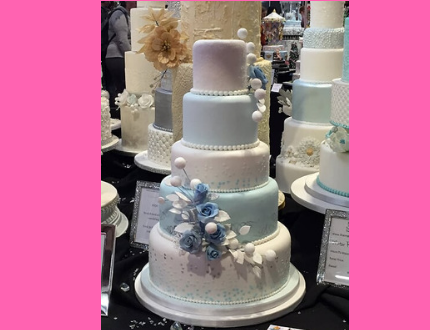 This is my second time displaying at Cake International with CakeFlix, having also displayed in 2017. 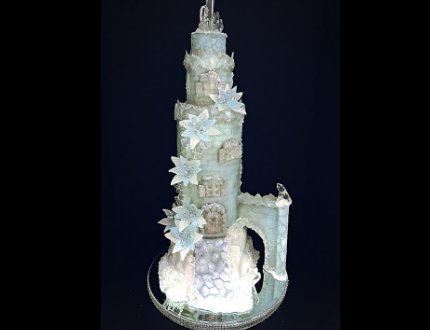 I chose the fairy castle theme for my cake this year because although I wanted to do a tiered cake, I still wanted to include some models and this design allowed me to do both. The cake took me about 10 hrs to make over a week and I loved every minute of it! From creating my design with the help of the CakeFlix tutorials, to the excitement of travelling up to Birmingham to deliver the cake and getting to meet Paul, David and the rest of the team. CakeFlix is a fantastic tool that keeps my baking ideas fresh and fun. 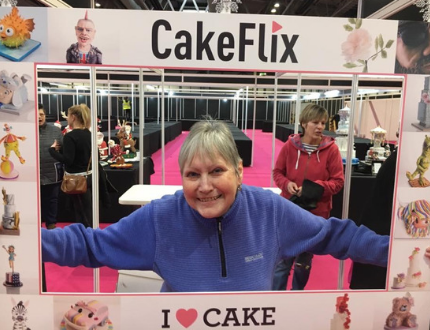 I have been a CakeFlix member since 2015. I realized as soon as I started my business that same year, it was the right place for me. The online classes allowed me to be coached at my pace, as I set up my business. I have displayed in the Group entry three years running. The first year was just about building the courage to display at Cake International and I managed the Christmas Gift Box piece that year. The second year, I was part of the Spring theme group and demonstrated the Circle of Love Cake tutorial. This year, I was lucky to be part of the winning Winter Wonderland Wedding Cake Stand. Because I've learned that clients want to see the range from classic to elaborate, I purposefully kept my design simpler than the taller more elaborate cakes. There was another reason, it would also double up as a show cake for my wedding fairs. My entry was called Snowball Love. It was a 5 tier piece in an Ice Blue & White theme. It had Ombre Royal Icing stencilled hearts with Blue/White Floral arrangements. I used various elements from a selection of the tutorials online and the design helped me demonstrate and practice my sugarflowers, working with royal icing, stencilling and how to use cake lace and moulds. Hi, My name is Viv and I"ve been making cakes for the same amount of time as I've been a CakeFlix member (5 years). This is my third year doing the display at Cake International and this year. This year I chose the Fairy castle design as I love being able to use my own imagination and use the skills learned from Paul's tutorials. In total, the Cake took me 18 hrs in total to make and just to be in the display is a feeling of great achievement and the support everyone gives within the group is utterly out of this world. I have been a member of CakeFlix for 3 years and have been making cakes since I was a child. However, the first 'decorated' cake I made was when I was 18 for my boyfriend's (Now husband of nearly 25 years and i’m 48 so say 30 years!!! Omg!) I only really made cakes as a hobby to be honest, up until 2015 when I decided to open my first business. I have been part of the display since they started putting on the tables at Cake International 3 years ago. This year I choose my design because I wanted to do something different from what I'm used to. I’m mainly asked to make novelty cakes, so I wanted to go out of my comfort zone to demonstrate my range of skills. I also wanted to use the traditional skills I learnt at college, but with a modern twist so I went with the carousel cake. The cake took 30 hours to make including planning and trial attempts. I was worried that my cakes wouldn't be good enough when I first considered displaying, but as soon as I arrived and saw how amazing and magical the table looked, all those fears vanished. It was great to meet Paul and David an get to know them, as well as receive advice and encouragement in person. It was also surreal to meet fellow members, put faces to names I have corresponded with online and make loads of new friends with common interests. The whole vibe of that CI experience gave me the confidence and courage to enter competitions on my own. The following year I entered our local Sugarcraft Guild as part of a Branch table, and also individually entered my work at Cake International. I also made the Music Box cake for the display booth that some of you who passed the CakeFlix stand might have seen! The whole experience has challenged me, but also made me realise I can do something I should be very proud of. was my first time as part of the group at Cake International. I chose to do the Fairy Castle for my theme because I love castles and it was an opportunity to make something that I might not have had a chance to otherwise. Due to the fact that the cake was a dummy it took about 6 hours to make. The most time consuming part was making the flowers and doing the isomalt bias relief and crystals. For me this was one of the best experiences of my life! At first I was pretty scared and hesitant because I was the only one coming from the US and I really didn't know anyone or have much experience in cake decorating. Much to my surprise, from the very beginning when our display group was formed we became like family. No matter your level of experience or questions you might have had, everyone was so kind to offer help and encouragement. Every cake decorator has their off days and sometimes needs that extra push or lift, and the CakeFlix display members and Paul were always there to offer comfort and sincerity when it was needed. I was and am still in awe at the companionship that was formed in this group! Everyone was greeted with hugs, smiles, and laughter. It was like we had known each other for years! Once all of the cakes were set up, all you had to do is sit back in awe of every single master pieces that had been created. Although, my cake was unfortunately destroyed on the way to the UK, and as heartbreaking it was, not once did I feel left out or out of place. I still was a part of Paul's, CakeFlix team! There is something that can be said for "there is no I, in team" because we were there for each other every step of the way and I know these new found friendships will last for years to come. We are the The CakeFlix Cakers! I've been a member for nearly 18 months now and been making cakes for roughly the same amount of time. Being part of CakeFlix has been great as I've learned so much. I chose the fairy castle as it was something I hadn't done before and I have certainly never made anything as big as that before so I thought it would be fun. The whole piece took me around 40 hours to make in total. I had an amazing time, learnt so much, met some incredible people and thoroughly enjoyed every minute of it. This was my first time on the display, but hopefully not my last! This was my second time displaying on the CakeFlix table at Cake International. I was very nervous/happy/proud to take part in the Paul Bradford 'CakeFlix' display. I was worried that my fellow members would be far more experienced and far more talented than me, so I was worried about 'letting them down'. I needn't have worried though as everyone has their own level and talent and everyone encourages/helps support each other, Paul's happy to lead, help and support. I made my cake, all in a rush, as ended up with too much 'real work' at the end of my busy season here in Ibiza. With the help of my husband, we transported the cake by road and 2 ferries to the UK. It was again a wonderful fulfilling experience. Made even better by the fact that the Winter Wonderland table (which I was part of) won the best in our category. I have been a CakeFlix member about 5 years and I have been making cakes for 10 years. To create my design for this show, I looked through Paul's tutorial's and just started to build the design in my mind as I went along. In total it took about 48 hours or so to create. Although I was stressed to start with, I found making the cake so enjoyable!! The experience at the show was wonderful and I felt so proud to be part of such a talented team, the 'icing on the cake' was going to the Awards dinner on the Saturday evening where CakeFlix were awarded with 'The Best Learning Experience'. 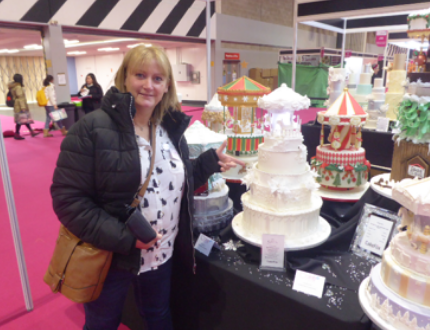 I've often been to Cake International and thought 'next year – I'm going to enter – definitely'. The year flies by and I start to think about making an entry and my confidence takes a nosedive – a pretty big one! I end up just visiting CI and looking on in awe of all those that managed to get a piece to the show tables. It's been the same with starting my business. I've made cakes for my children and family for well over 27 years and for the last 7 of those I've talked about starting the business. I do loads of research, fill in forms and then never actually do it. I joined Cakeflix in 2012 and became a Pro member in January 2018 in the hope that it would be the push I needed, it has been, although I've really been the tortoise not the hare!! When the opportunity came to join the Display tables this year, I decided to do what I never had before and jumped at the chance to get a piece displayed at CI. Especially since I'd be doing it as part of a group, rather than have the huge amounts of stress that I assume comes with an individual entry! It turned out to be my BEST decision ever! 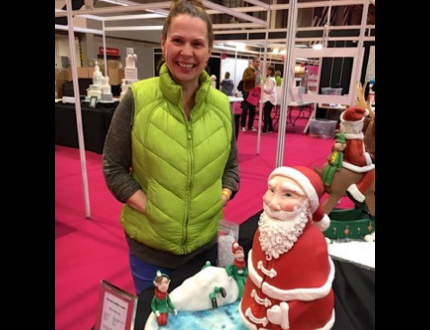 I chose Santa's Army, mainly because I had no confidence in producing a fantastic wedding or carousel cake (sssh – don't tell Paul!). My piece, 'Skating Santa' took almost 35 hours to make (not including time for baking or social media distraction). Driving to CI was scary, every other car on the road seemed to be driving at me, on purpose! I was super nervous dropping it off at the CakeFlix tables at CI but Paul and David were just brilliant, super helpful and so friendly. Seeing my cake on the table with all the other Santa's was an awesome feeling, all the hard work was certainly worth it. Join the CakeFlix community now and start your cake journey today! With tutorials for everyone from beginners, hobbyists, professionals and business owners, we have you covered!